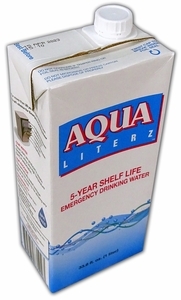 Aqua Literz (1,000 ml | 33.8 oz) boasts a 5-Year Shelf Life without the addition of additives or preservatives. All water is received from a municipal water source and undergoes a UHT Pasteurizing Process before being packaged into a sterile, hermetically sealed, seven-layer carton. Also features a resealable cap. No risk of water molecules penetrating packaging, No risk of package migration or unsavory taste. Now featuring a innovative screw-on cap!